After 2 solid weeks of being down in the dumps about this move at work, I’ve finally come out of it and adjusted to this new professional change. I’m also starting to actually get into this whole summer vacation thing after the hectic pace of the school year end. 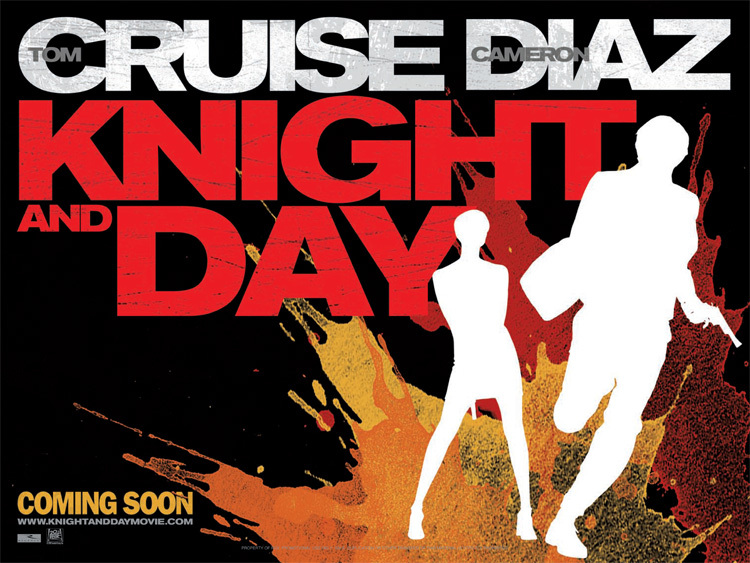 So to try and get this blog back on track a little, here’s a quick review of Knight and Day, the new Tom Cruise/Cameron Diaz summer bubblegum movie. I have to say, I adored this movie. It’s the most fun I’ve had at the movies in a long time. Cruise’s personal life has been like a roller coaster of one weird episode after another over the past 5 years, and because of that we have all forgotten that at his core he is an incredibly likeable and charismatic movie star. There is a reason that before Will Smith took over the throne (Google it, the world agrees), Tom Cruise was the biggest movie star in the world. Both of them have a funny, easy charm that makes watching their movies kind of a treat. And the PR circus that has been Tom Cruise’s career over the past several years just reinforces my feeling that the less we know about a star’s personal quirks, the better. Except in the case of Mel Gibson. I’m glad we all know what’s actually going on in there, and I haven’t given money to any of his film exploits since Signs in 2002. And I intend to keep it that way. Couch jumping Scientologists are one thing, Mel Gibson is another. But anyway, I digress. Back to Knight and Day. Cameron Diaz is equally charming as Jane, who runs her deceased father’s car restoration business. I will say this about Hollywood: where do they come up with these jobs? Anyway, Jane is boarding a plane home to Boston with carry-on luggage full of parts for a car she’s restoring for her sister’s wedding. Which is on Saturday, she has to be home for it. Tom Cruise’s Roy Miller scopes her out, follows her through the airport, tries to keep her off the plane, but somehow she manages to end up on this flight anyway (all is revealed in the movie). Except the flight is apparently lightly filled with assassins and crooked federal agents. And Tom Cruise is a spy. And he kills everyone on board, including (accidentally) both pilots, while Cammy D. is in the bathroom deciding whether or not to hook up with him. And so begins several chases: Jane runs from Roy, who chases her. Roy runs from the federal agents, who chase him. A scientist (again, all is revealed in the movie) runs from everyone, and everyone chases him. And there are various other combinations of those chases throughout. But through it all, Tom Cruise is the best part of watching this movie. Like when he’s hanging from the hood of a government car, shooting at bad guys, while Jane is inside trying to steer over other bad guys in the bridesmaid’s dress she was wearing while abducted by bad guys at a fitting, and Tom Cruise tells her, “I love the dress, you look great!” The end was a little too cobbled together for me, but up until the last 5 minutes I was having a really good time. Why aren’t there more summer movies with fun banter instead of nonstop creepy CGI robots that talk? Sure, this movie has some CGI. But it’s not in 3D, and there are no robots. Win.